President Trump issued an Earth Day statement Saturday that promotes his environmental approach and underscores his sharp break with Obama-era policies. 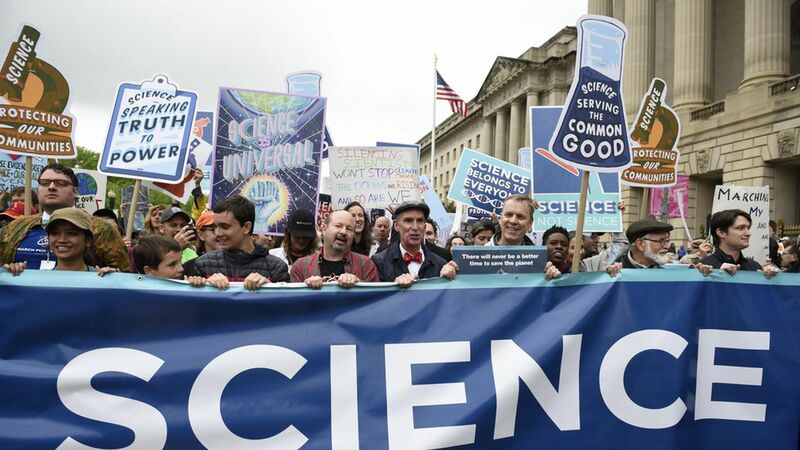 Why it matters: Trump's statement arrives amid the "March for Science" in Washington, D.C., and cities worldwide, where demonstrators are in the streets decrying Trump's moves to cut funding for science programs, and unwind various environmental and climate regulations. What it doesn't say: The statement breaks with many of Obama's Earth Day messages by omitting any mention of climate change. Battle lines: The 188-word statement seeks to parry arguments that Trump's aggressive deregulatory push will hurt the planet, arguing that the administration is "reducing unnecessary burdens" while being mindful of the environment. It also appears to respond to the March for Science without mentioning it directly. "Rigorous science is critical to my Administration's efforts to achieve the twin goals of economic growth and environmental protection," it states. Quick take: The statement has language that's consistent with the administration's skepticism of the scientific consensus on human-induced global warming. "[R]igorous science depends not on ideology, but on a spirit of honest inquiry and robust debate," it states, using the type of phrasing that's common in climate-skeptic circles.